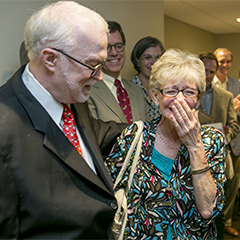 Samford University’s Beeson Divinity School announced the name of its new reading room in honor of former longtime receptionist Sandy Brinson in a Sept. 29 ceremony. The reading room is located in the newly-renovated student commons in Divinity Hall. Brinson, who worked at Beeson for 22 years, was shocked by the announcement. She said that she could not have had a better place to work, especially as she experienced the death of her son, parents, and grandparents during her time at Beeson. Brinson was joined by members of the community as well as special friends of Beeson. She also was surprised by the attendance of her daughter, who drove from Atlanta to be a part of this special recognition. The announcement of The Sandy Brinson Room came at the end of a special service of blessing of the commons led by George and Samford President Andrew Westmoreland. The student commons renovation began in mid-May and was completed in August. It was made possible by the generous gifts of faculty, alumni and friends.